T. pseudolanuginosus but always known as 'Woolly Thyme'. 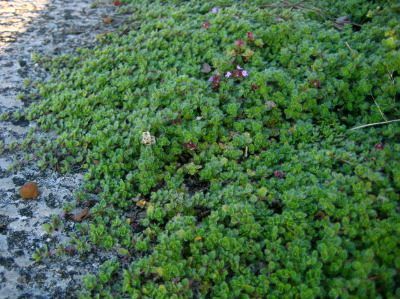 It can form wide-spreading mats (but can be restrained by clipping if it gets too large) and is clothed in small, intensely hairy, grey leaves, the hairs giving rise to its wooly name. Can produce small pink flowers but it is often shy flowering. A fabulous foliage plant like no other, especially seen draping over a rock or edging its way over paving where it will release its aromatic fragrance when trodden upon. In cold areas (like here) it takes on a purpleish hue in winter.